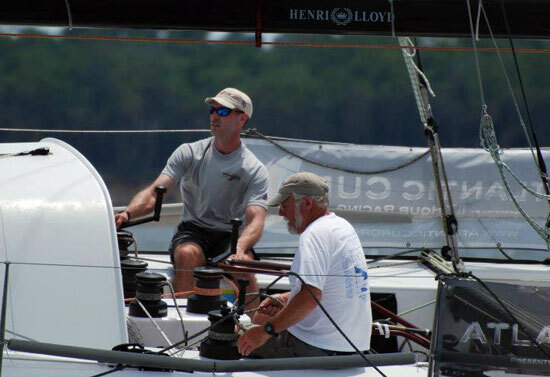 Just as we did in 2012, Matt Scharl and I teamed up again aboard Bodacious Dream to compete against some of the best sailors in the world in 2013′s Atlantic Cup Race. In 2012, with the boat brand new, we finished 2nd in the final standings; this year we did even better. The FIRST leg of the race, began on May 11th and was a 648-mile long run from Charleston, SC to New York City. In this initial leg, we had to weigh the advantages of venturing farther out from the coast to catch the Gulf Stream in order to gain some additional speed from its faster moving currents, or to stay closer inshore, for a shorter route and maybe more wind. As it turned out, the Gulf Stream was a bit further off-shore than we anticipated, and it took us a while to get there, but once we were there, we knew it, because our speed over the ground was greater than our speed through the water, not to mention the warmth of the water spraying in our faces accompanied by warmer air. Strands of Sargasso grass marked its western edge and numerous flying fish playing about. These are all traditional signs that you’re in or near the Gulf Stream. We sailed the next 24 hours knowing our two main competitors were both within 7 miles of us, and had taken the shore strategy. Caught in a turbulent and unpredictable weather system, we considered many different scenarios but once we closed with our competitors, and could see what strategy they were pursuing – Matt and I agreed on the perfect scenario for the situation … which was to do whatever it took to stay between our competitors and the finish line! Happily, we held onto the lead all the way to New York City, though the fine sailors of Lecoq Cuisine – Eric LeCoq and Conrad Coleman - were on our tail the whole way, and ended up arriving in New York City only 8.5 mins after us! Last year’s first leg had us in the pursuit position almost all the way, before settling into third position. This time we led the field! 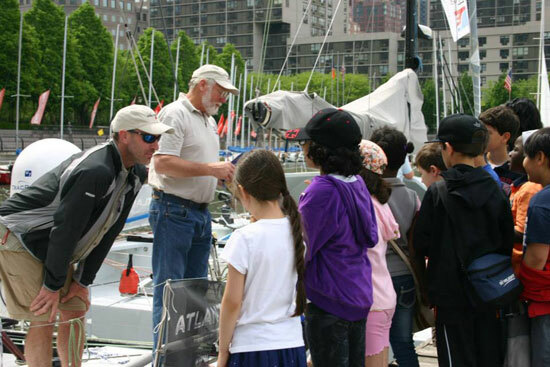 During a great layover week in NYC, Matt and I got to participate in the Atlantic Cup’s “Education Day.” This event produced by 11th Hour Racing in conjunction with the dedicated folks at The Rozalia Project, who are working for a cleaner ocean, gave several of us skippers the privilege of spending time at the marina, where our boats were all moored, hanging out and talking to some very inquisitive kids about sailing and about the perils of marine debris. After the race, the folks at 11th Hour Racing asked me to write a blog post on my experiences that day and with learning in general – a subject very close to my heart. You can read that post right HERE! As those of you who have been following our exploits for a while know, learning and discovery are a big part of our Bodacious Dream. To that end, we launched Bodacious Dream Expeditions earlier in the year in conjunction with a cruise along the coast of the Baja Peninsula, where we had a great time sharing videos and updates with our friends on the BDX website and on the BDX Facebook page. Even in races like the Atlantic Cup, where the demands of racing must take precedence over interactions around learning, we still prepare our Expedition Overviews as well as our Explorer Study Guides for each of our ocean-going adventures. We will be holding to this same “shared learning” model when fall comes around and Bodacious Dream and I set off on our single handed sail around the world! Stay tuned for more on that! 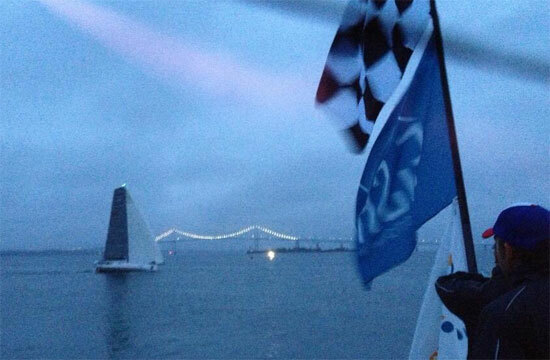 But back to the Atlantic Cup … Leg TWO was upon us – New York City to Newport, Rhode Island. The SECOND Leg began like a shot and continued that way straight to Newport, RI. We started out in an unpredictable upwind heading out of New York City harbor with the winds going our way one minute and some other way the next, all the while picking our way through ferries, barges, ships, recreational traffic and the constant drone of helicopters, all of which made for some strange kind of energy. We made it all the way to Sandy Hook without tacking, and then were able to clear the point on one tack heading down to the turning mark off Barnett’s Inlet where we rounded the lighthouse and headed back north towards Newport. As we approached Block Island, we knew the opportunity was there to take over the lead if we could play it right. We worked some of our Midwestern hoodoo and managed to slip past Lecoq Cuisine, after which we proceeded to sail as fast and furious as we could towards the finish, hoping that Gryphon Solo 2 had lost some ground coming around the eastern side of Block Island. For an anxious hour or two, we sailed hard, scanning the misty rain for sight of Gryphon. When they finally emerged from out of the fog, it was to our right and in a position slightly behind us, at which point we were in the lead position going into Narragansett Bay. From there on, our first (and second!) order of business was simple enough … to keep going as fast as we could and to get to the finish line before anyone else. Just about an hour later, we entered the narrowing Narragansett Bay, first across the finish line; exhausted, elated and excited at winning Leg Two of the race. This was also a repeat performance of our unexpected win in this leg last year! At this point, Matt and I were feeling very grateful for our great good fortune so far in the race. 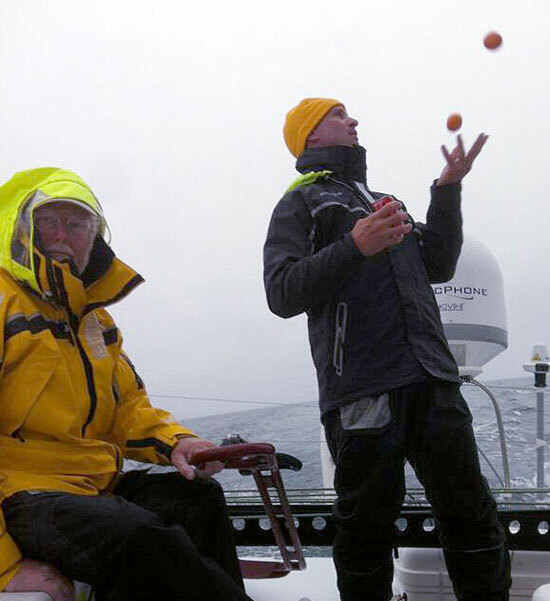 Somehow amidst all that action, Matt decided to forego rest and to juggle clementinas for a bit of stress release! There were many exciting sections of the second leg which kept us all in a state of perpetual excited awareness. I don’t think I’m being overly dramatic when I say it was an epic race … and here are SOME of the reasons why. Lecoq Cuisine - who finished 8.5 minutes behind BoDream in the first leg – finished just 5 minutes behind us in this one! Gryphon Solo II finished 3rd, just 10 minutes behind BoDream. Weather and wind conditions and variations were extreme and diverse. And here’s a fun edited video from the Atlantic Cup the captures some of the thrill of the NYC-Newport Leg. 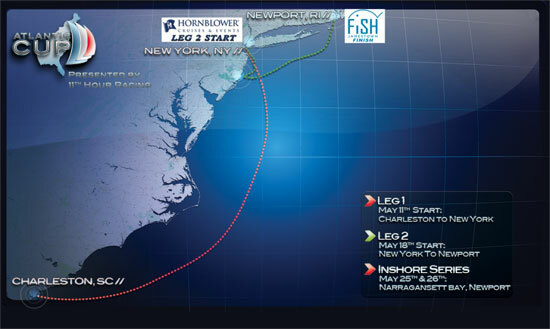 The THIRD leg of the race was the “inshore” leg. Now for those of you who might be unclear about the difference … “offshore” racing is open-ocean racing – from a starting point to an ending point, and it’s what we did in both Leg One and Leg Two of the race. 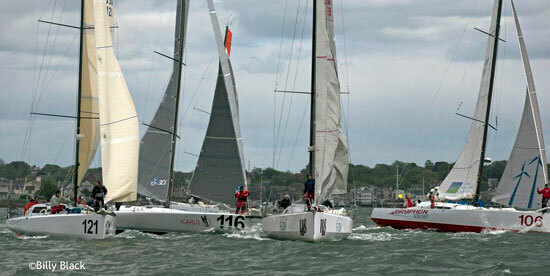 “Inshore” racing is what we did on Narragansett Bay. As it involves so many quick and difficult maneuvers, each of the boats had up to 6 crewmembers onboard. 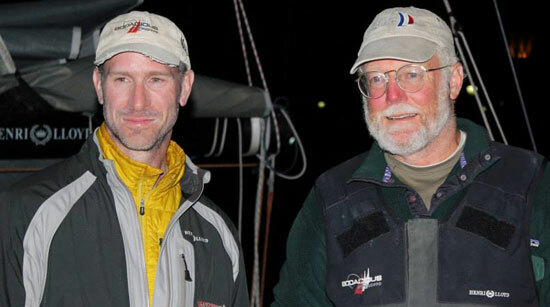 As Matt Scharl had to take off for the Midwest, for this next leg, I was joined aboard Bodacious Dream by Jay Cross, Jay Hansen, Christer Still, Skip Mattos and Ryan Scott – stout-hearted competitors and experienced seamen, each and every one! The “inshore series” was made up of five races over two days … with all seven boats in each race. Each team got to keep their best four finishes. These are typically very short races, 15 miles or so in overall distance on a mapped-out course around a series of buoys in the bay, with the legs themselves often less than 2 miles in length. 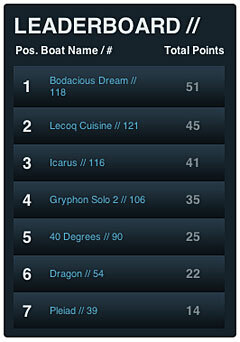 So on Day ONE, we hit the water running, and after finishing 3rd and 6th respectively in the first two races, we kept BoDream holding steady through the third race, outlasting and finally passing Lecoq Cuisine and Gryphon Solo 2 to win the last contest which put us back in the overall lead. Through it all, our crew was unstoppable – even though at times it was more like hand-to-hand combat than sailing! But they never gave in, and every time we did things right, Bo just kicked up her heels and danced! Day TWO of the inshore racing proved to be another incredible day on the water. It is in the nature of these competitions, that fortunes can change so quickly … and going into this last day, it was still a wide-open race – with #118 Bodacious Dream leading #121 Lecoq Cuisine by just ONE point, followed by #116 Icarus NINE points behind BoDream. So, the pressure was on everyone! 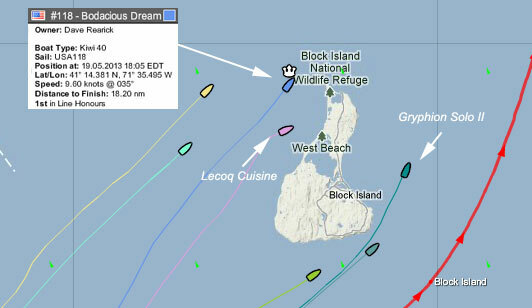 Throughout the second day’s races, Bodacious Dream held rock steady, rarely slipping position. With the exception of a 6th place finish in the second Saturday race, Bodacious took one of the top three positions in all the other 4 inshore races. Here’s a video recap by the race of the Inshore Series. All in all, it was an amazing finish to an amazing day’s racing that concluded an AMAZING three-week long competition, when Bodacious Dream was declared the winner of the 2013 Atlantic Cup Race!! You can click on these links here for more photos and videos of the race. The competion through all three legs of the event was non-stop … and every victory was hard-won and well-deserved. HUGE congrats to all seven teams and to the Atlantic Cup Race organizers. What a big thrill for Matt and myself and the whole Bodacious Dream Team! And that’s the scoop on what was surely one of the most memorable races in my life. I know I say it a lot, but I mean it … many thanks to each and every one of you who helped make another bodacious dream come true! - Dave and Matt & the whole Bodacious Dream Team!